Sir Edwin Henry Landseer RA (1802 – 1873) was an English painter and sculptor, well known for his paintings of animals—particularly horses, dogs and stags. However, his best known works are the lion sculptures in Trafalgar Square.Landseer was born in London, the son of the engraver John Landseer A.R.A. He was something of a prodigy whose artistic talents were recognized early on. He studied under several artists, including his father, and the history painter Benjamin Robert Haydon, who encouraged the young Landseer to perform dissections in order to fully understand animal musculature and skeletal structure. 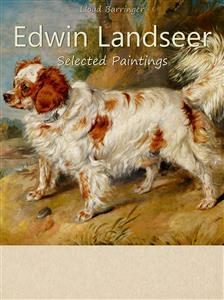 Landseer's life was entwined with the Royal Academy. At the age of just 13, in 1815, he exhibited works there. He was elected an Associate at the age of 24, and an Academician five years later in 1831. He was knighted in 1850, and although elected President in 1866 he declined the invitation.In his late 30s Landseer suffered what is now believed to be a substantial nervous breakdown, and for the rest of his life was troubled by recurring bouts of melancholy, hypochondria, and depression, often aggravated by alcohol and drug use. In the last few years of his life Landseer's mental stability was problematic, and at the request of his family he was declared insane in July 1872.